I know my red is late…it’s very late. I hate it when I’m behind, but I was all over the freeways today. Mostly driving from here to Pleasanton to go to a Gem Faire. It was meh. I’ve been to much better and I wish that my gem guys had been there. I found a new vendor and yay for me! Anyway, the color I present for this Friday’s red is a bit gorgeous, if a bit moody to work with. 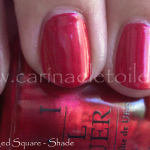 I have to admit that this bad baby is a gorgeous crème – it’s a pretty red with gorgeous blue undertones. I love that the beautiful shade looks pure and unfettered on my skin tone. However, it had a big flaw – application. Ugh. It was thin. It was runny. It didn’t do a nasty cuticle pull on me – thank goodness! However, it was…ugh. It was/is a beautiful red, don’t get me wrong. Two main problems: It was thin. So thin I had to do 3 coats. It took forever and a day to dry. See the picture? 3 coats. It took 3 hours to dry…and even then that drying was not guaranteed. So I put my hands in my hair after three hours and then BAM! There were marks in the polish FROM MY HAIR. What the hell? Three hours later? I was really annoyed given that I paid $21 dollars and I could’ve had a better drying time from a $1.99 polish from the drugstore. Yea, I went there. Anyway, enough of the bitchery and enjoy the end result – a gorgeous, vibrant red that really makes me happy despite the drama. I’ve just awarded you a Stylish Blogger badge, check out my blog for details, thanks!